Orchard Grass is an extremely versatile variety. This low maintenance groundcover is perfect for livestock grazing and can be used for pasture, hay or silage. It is considered one of the best forage grasses and is also used by birds for nesting, brood rearing, escape and winter cover. Orchard Grass is also a great solution for erosion control and can be planted as a cover crop. This cool season grass grows to be about 18” tall and the cool season grass is one of the earliest species to grow in the spring. We recommend cutting once it reaches ankle-high and then cutting every 4-6 weeks after that. Although this grass is a perennial, it may need to be re-seeded in the fall or spring, depending on usage. 5 lbs covers 8,712 sq ft.
10 lbs covers 17,424 sq ft.
Download our printable Grass Planting Guide, with Seeding Rates. Create a Low-Maintenance Lawn or Add Nutrients to Your Soil with Grass and Groundcover Seeds. 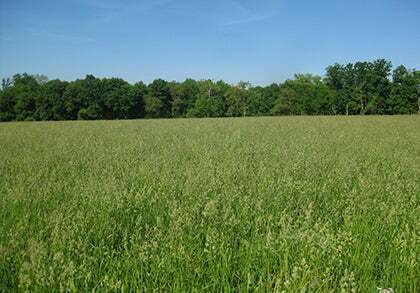 Orchard Grass is a versatile variety that can be planted as a cover crop. Planting Grass Seed in Fall or Spring: The ideal time to plant grass seed varies by hardiness zone, but is usually in the spring, once temperatures have reached a consistent 60 F and there is no more danger of frost. Grass can be planted through the end of July but no later. If you’re planting in the fall, wait until after there have been a few killing frosts so the seeds you plant will lie dormant until the spring. If you're planting grasses, legumes or clover to replenish nutrients, suppress weeds or more, we recommend planting in early to mid fall. Let the grass grow until frost. Come spring, mow before it goes to seed and then till the soil. Wait 3-6 weeks before planting new crops. Which plants are best for cover crops? Clover, Peas, Vetch and Rye Grass. Planting Rates: How Much Seed Do I Need? Planting rates vary depending on the size of the seed. A larger seed (such as a Fescue) can be seeded at 10lbs/1,000 square feet. A smaller seed (such as a Bluegrass) can be seeded as low as 2lbs/1,000 square feet. To see planting rates for each individual variety, please view the chart on the back page of this guide. If you’re still unsure of how much seed to use in your area, please give us a call at (877) 309-7333. We recommend leveling the planting area as much as possible to eliminate high or low spots. Till the soil if possible about 4-6 inches deep, as the soil should be loose and clump free before planting. If your area is already somewhat bare and even, we recommend skipping the tilling process as it can promote new weed growth or unwanted grass growth. You can then add a product to help aerate your soil to improve seed germination, but this is not necessary. 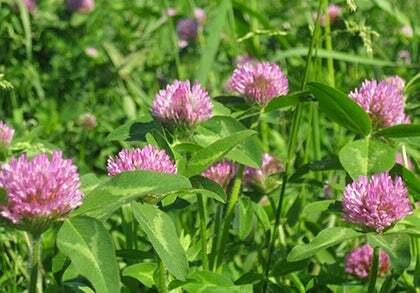 Medium Red Clover helps add nutrients to soil. After your soil is prepared, apply the seed at the recommended rate. See the back of the this guide for seeding rates. To make sure you're spreading the seed evenly, scatter 1/2 of the seed walking north to south and 1/2 of the seed walking east to west. If you have poor soil, you could lightly apply an organic fertilizer after seeding, although this is not a necessary step for strong growth. Many choose to cover their grass seed after planting, even though this is not necessary. If you do choose to cover your seed to help retain moisture and hold the seed in place, we recommend a maximum depth of 1/4”. You can cover the seed with topsoil, sterilized straw, or peat moss. Coated seeds such as Bermuda and Clover seeds should not be covered more than an 1/8” deep. Water gently and regularly, keeping the seeds moist until they begin to sprout. This could mean watering more than once a day if you’re having a dry spell. Once the seeds sprout, water deeply and less frequently. This helps to ensure a deep rooted, healthy lawn or meadow. Do not mow until your lawn is at the recommended height. This information can be found on our website at the specific product page. For most grasses, this is about 3-6 weeks after planting, but could be longer depending on growing conditions. Remember to be gentle when mowing the first few times — the seedlings will be somewhat tender. After mowing several times, you can apply an organic fertilizer to promote strong growth, but this is not a necessary step. It may take weeks or even a month for the seeds to grow. Be patient. If you have any questions about germination time or planting, please don’t hesitate to call us at (877) 309-7333.